The Foxtail palm (Wodyetia bifurcata) looks pretty much like a Royal palm, but it's a completely different species, discovered only in 1983. 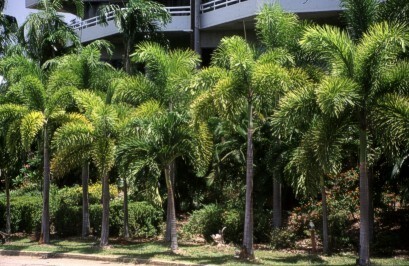 It made a quick carreer as garden palm for it's lush and elegant looks. These ones here are still small, probably because they're planted with such a small distance. With more room, each of them could probably grow 4 times that wide. But of course, there isn't always that much room.